Keep the garbage disposal clean by running it with dish soap and cold water after washing dishes. Run the disposal regularly to prevent rust and ensure consistent operation. Always run cold water when grinding food. Cold water makes grease turn solid so the disposal can chop it up. Use the garbage disposal for small chicken or fish bones and egg shells, because these rough materials will help clean the disposal’s walls. Cut up waste food into small chunks before dropping in the garbage disposal. Big pieces can cause jams and put stress on the motor. Throw in a few ice cubes and grind them twice a month to give the disposal a quick, easy cleaning. Don't put trash in the garbage disposal. Paper, plastic, glass, and metal can damage the blades and motor. Don't pour accumulated grease or oil into the disposal or drain; put that in the garbage can instead. It will lower the performance of your garbage disposal and could clog the drain. Don't turn off the water before you’re done grinding. It should run for at least 15 seconds after the garbage disposal turns off to ensure it is clean. Don't put large pieces of food, potato peels, or very fibrous foods like corn husks, onion peels, or celery stalks into the disposal. Don't throw coffee grinds down the drain. They can build up and cause clogs. Don't use bleach or drain cleaners in your disposal. Harsh chemicals can damage the blades and pipes. Use borax instead! Don't drop expandable foods such as rice or pasta down the drain; they should go in the garbage can. These foods can expand in the pipes just like they do in a pot of water, often causing clogs. By following these pro plumber tips, homeowners can keep the garbage disposal in great shape for years to come. 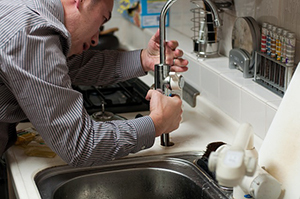 If a burning smell, a strange sound, or any shaking occurs when running the garbage disposal, contact a plumber as soon as possible to protect the disposal from serious damage and avoid the need for drain cleaning or fixture repair. Those that do need professional help in the Dousman, Wisconsin, area should call Traditional Plumbing today at (262) 470-1228 or visit them online to schedule an appointment.